Surviving the destructive forces of nature is the subject of our next work. Let’s take a look! When you look at this painting, where do your eyes go first? Do you notice the volcano first? Why is this so? 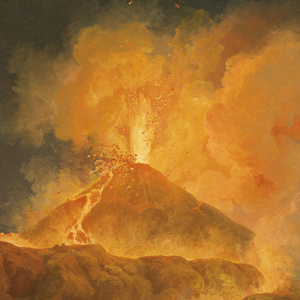 Is there any part of art, such as color or shape, which makes the volcano stand out? The fiery yellow and orange colors make the volcano stand out. These bright colors play against the dark blues and grays of the water and nighttime sky. Bright colors like yellow and orange naturally pop forward. That is why you notice them first. Dark colors like inky-blue and gray, on the other hand, naturally fall into the background. Let’s play a game. Let’s follow the pathway our eyes take as they move across the canvas. First we notice the volcano erupting in the background because of the bright colors. Next our eyes move down the left hand side of the volcano, and we notice the mountains in the middle ground. What part of art moves our eyes from the middle ground into the foreground? The foreground is the space that appears to be closest to us. The diagonal line of the bridge brings our eyes from the middle ground into the foreground. Diagonal lines create movement and energy and action. They also create depth. Let’s continue. Our eyes follow the diagonal line of the bridge, where we see a jumble of people and carts and carriages and horses fleeing from the fiery volcanic explosion of rock and gas. 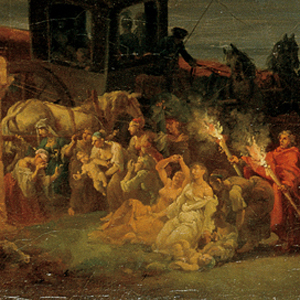 Next our eyes move into the foreground, where we see a group of women and children gathered and a man holding torches. Look closely. How are the people reacting to the danger of the volcanic eruption? Are some of the women fainting? Next our eyes move to the bottom left hand side of the canvas, where we notice two men carrying a woman to safety toward the water where there is a small boat with two boatmen. 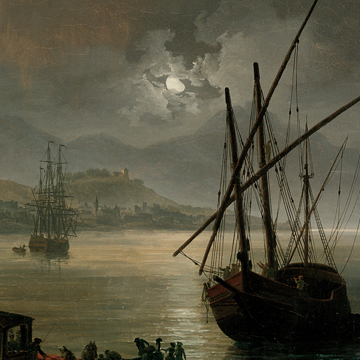 After this, our eyes follow the nearly horizontal line of a stonewall toward the ships in the bay, and then we notice the dark gray mountains and moon in the far distance. Finally, our eyes travel upward along the diagonal line of the right hand side of the volcano, and we end up at the same place we began—with the bright colors of the erupting volcano popping forward! 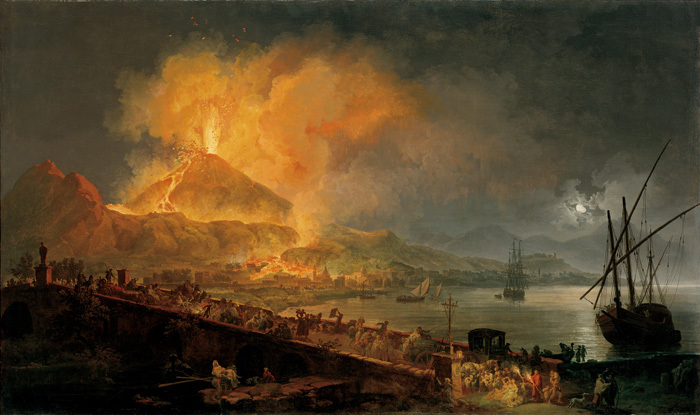 This is a painting of a real volcano in the Gulf of Naples in Italy that erupted many times over the centuries and once a long, long time ago buried the ancient Roman cities of Pompeii and Herculaneum and killed many people (79 AD). Do you know the name of this volcano? It is called Mt. Vesuvius. Vesuvius is considered to be one of the most dangerous volcanoes in the world. This picture was painted in 1777 by the French artist Pierre-Jacques Volaire as a souvenir for a wealthy English traveler, Henry Blundell, who visited the area on his tour of Italy. That was nearly two hundred and fifty years ago. What clues in the painting tell you the people in this painting lived long ago? Their clothing is old fashioned. They’re using torches for light. They’re riding horse-driven carriages and carts and ships with sails. Do you know why volcanic eruptions occur? Planets have lithospheres—a rigid outermost shell. On Earth, the lithosphere is made up of the crust and a portion of the upper mantle. It is believed that the Earth’s lithosphere is broken up into seventeen major, rigid tectonic plates that float on a hotter and softer layer in its mantle. On Earth, volcanoes are generally found where tectonic plates are diverging or converging. When these plates move, they cause earthquakes and volcanic eruptions. What is a volcano exactly? A volcano is a rupture in the planet’s crust, which allows hot magma, volcanic ash and gases to escape from below the surface. What is magma? Magma is molten rock and sometimes dissolved gas and gas bubbles. When magma reaches the surface, it is called lava. What is ash? Ash is pulverized rock and glass. It may be just me, but this artist seems to have used the parts of art to create a scene with so much danger, I can almost feel the intense heat of the lava and hear the spewing ash and the cries of the men and women and children! Natural forces across the earth’s surface change landforms. Lava flow from an erupting volcano is one example of a natural force that changes landforms. As we see here, lava is being deposited into a bay and is building up many layers of material. Can you think of other natural forces besides erupting volcanoes that change landforms? The water cycle that occurs in melting glaciers and snow can change landforms. How so? The water cycle transports solids like sediment, soil and rock across the earth’s surface and deposits them elsewhere. Name some other natural forces that transport and deposit solids. Wind, the force of gravity, and living organisms such as burrowing animals are some natural forces that transport and deposit solids. What is this process called by which soil and rock are removed from the surface and then are transported and deposited in other locations? It is called erosion. Human activity can also cause erosion. Exactly how does human activity cause erosion? Erosion is caused when people clear land, plant vegetation, cut down trees, and build structures like dams that change the flow of water. Look closely at this painting a moment longer. A painting is often a flat surface, correct? It is two-dimensional. So how do artists make the scene in a painting look three-dimensional. In other words, how do artists make things appear closer or farther away? How do they give it perspective? How do they give it depth? Artists use bright and dark colors and diagonal lines to create distance and depth and make things appear closer or farther away. What other parts of art do artists use to make a scene look three-dimensional? Artists alter the size of objects. Look at the boats in the bay. Do some of the boats appear to be farther away than others? How has the artist shown this? He has painted boats of different sizes. Several boats in the bay appear to be farther in the distance, because they are smaller than the boats that appear to be closer to us. How else do artists make things appear closer or farther away? Artists use overlapping. Where do you see overlapping? Look at the moon and the clouds. The clouds are overlapping the moon. The moon appears to be farther away. Eye-spy the other spots in the painting where there is overlapping. Take your time. There are many overlapping objects in this landscape. Can you think of another way artists make things appear closer or farther away? Artists remove the detail on more distant objects. Compare the detail on the mountains in the distance to the detail on the mountains in front of the volcano. The mountains in the background have far less detail than the mountains in the middle ground do. Volcanic eruptions are powerful forces of nature. What are some other powerful forces of nature? Hurricanes and tornadoes and earthquakes are some other powerful forces of nature. What would you do if you were trying to flee from a volcano or hurricane or tornado or earthquake? Would you save your family? Would you save your pets? Would you take your favorite things with you and hide in a safe place? Or would you leave everything behind and run like the dickens? Would you like to see The Eruption of Mt. Vesuvius in person? All you have to do is visit the North Carolina Museum of Art in Raleigh, North Carolina. The Eruption of Mt. Vesuvius is in the European galleries at the museum. Or perhaps you would like a tour. Tours of the collection are given daily, except for Monday when the museum is closed to the public. If you prefer, you can contact the museum ahead of time and arrange for you and your friends to have a private tour. I’m sure a docent at the museum would be happy to show you and your friends The Eruption of Mt. Vesuvius and many other works of art. Whether you visit the museum on your own or have a tour with a docent, it will be well worth your time!